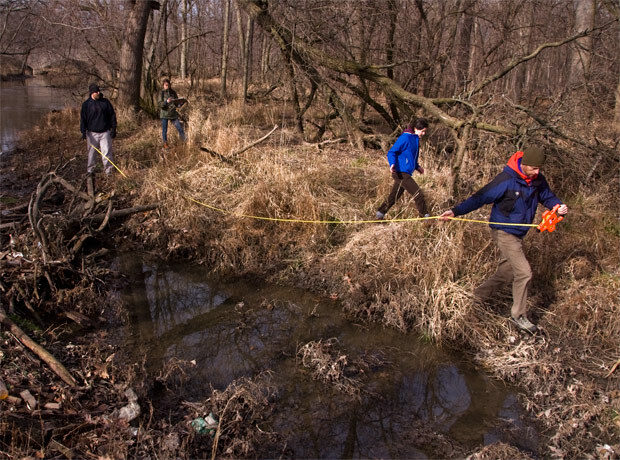 Volunteers measure gullies in Edgebrook Woods on Chicago's far northwest side. Volunteers measure gullies in Edgebrook Woods. Before development clogged up natural plumbing with impervious surfaces, every drop of rain that fell within the Chicago River watershed would seep slowly through the soil into the river. Now as much as 42 percent of Cook County is covered with surfaces that do not absorb water, and instead channel it more directly into the river. That runoff scores the landscape as it speeds through the watershed, carving out gashes in the soil over time. These gashes, called gullies, are like small ditches that let runoff water scrape away soil as they funnel it into the river. In their effort to catalogue these scars and repair the ecosystem, Friends of the Chicago River has turned to crowd-sourcing. Gullies are a problem all over the Chicago River watershed, which comprises hundreds of square miles. The goal is to gather GPS data along at least 50 miles of the river. Once they know the size and locations of the gullies, they will dispatch volunteers to repair small ditches and call in contractors for the heavy lifting. “We talk about restoration, but we don’t really mean it too literally,” Quail said, leading the group through Edgebrook Woods on the city’s far northwest side. “That would mean turning the North Shore into a muddy swamp.” Instead the term takes on a more general meaning: restoring nature to the urban environment. Before Chicago developed, the river meandered through a series of wetlands and marshes. Now it flows between concrete walls. Volunteers measured the width and depth of several gullies Saturday, recording GPS data along the way. As they tracked the river downstream through the forest, they came to a hill topped with a parking lot. Standing water at the foot of the hill bled into a mat of shallow ditches — it was the source of the gullies. In the summer, Quail said, the runoff&apos;s path downhill would be more clear, appearing as chutes between the vegetation. A few years ago, Edgebrook Woods volunteers built a rain garden of native plants where a curb cut in the Forest Preserve’s access road released stormwater into a field. After two 100-year storms hit in as many years, though, water began to pool up beyond the rain garden. So volunteers built another one. And another. Several years and four 100-year storms later, three rain gardens helped stabilize the flow of water off North Central Avenue.